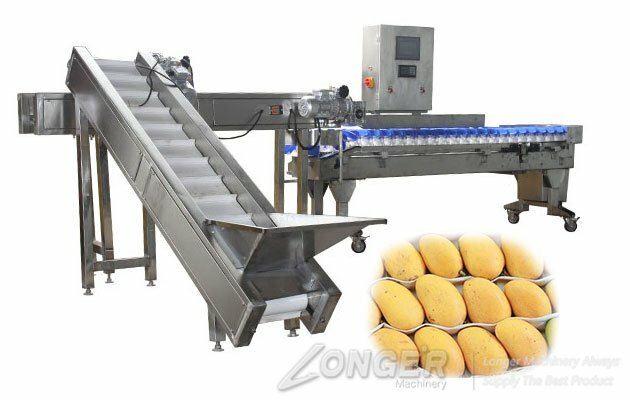 The automatic fruit weight sorting machine for apple, pear, persimmon, onion, mango, citrus, lemon, potato, grapefruit and other fruits and vegetables is made up of 3 main parts. 1. automatic feeding part: the fruit is sent to the conveyor belt by the automatic feeding machine. The fruit is sent to the weighing plate automatically. 2. automatic weighing part: calculate the weight of the fruit in the weighing disc through the electronic scale. 3. automatic classification part: automatically assigned to the designated area according to the different weight. 1. automatic, PLC control, set weight, logic and statistics as a whole. 2. good quality, high precision, less fault, long life, wide range of adaptation. 3. simple operation, high efficiency, compared with the traditional mechanical weighing, efficiency increased by more than 2 times.